← How much wood would a wood duck duck if a wood duck would duck wood? I’ve been having a bit of heart trouble recently that has caused me to seriously change my lifestyle. I don’t mean my activities. Heavens, I could never give up the BASE jumping or kayaking Class 6 white water rapids around the world. That’s just who I am. I’m talking about diet, specifically that insidious little nutritional group we know as fat. Oh yes, that sneaky little devil who likes to hide in some of our favorite places. Like that delicious satanic steak sizzling on the grill. Like that great smelling pot of buttery mashed potatoes beckoning from its perch on the stove. Like that comforting Klondike ice cream bar in the fridge diabolically invading your weak subconscious or that innocuous looking Oreo with its subliminal, but ever-present siren cry, “eat me, eat me.” Recognize any of these? Patty, my wife, sure did. Patty has always been a healthy eater. You know, the kind that you silently hate only because they’re eating an organic salad with vinegar dressing while you’re chomping down your second helping of country ham and hash browns. Over the years she has tried gently, but vainly to get me to improve my eating habits. She has now put her foot down. Right in the middle my bowl of chocolate pudding and whipped cream! Using the book Prevent and Reverse Heart Disease by Caldwell Esselstyn, Jr. M.D. as her main instrument of torture, she is converting me to a totally no-fat diet. And by no, I mean nada, zilch, squat and zip. Patty, or as she shall heretofore be known, Miss Essie, is no slouch. That sweet, demure and soft-spoken manner, although totally genuine, is the Dr. Jekyll to her authoritative, relentless Mr. Hyde. When it comes to getting me to turn around this lifelong eating habit that has caused me this harmful inconvenience, I ask no quarters because I know none will be given. By contrast, Simon Legree was a milquetoast. Stomach to liver: Have you noticed what Big Al has been eating lately? I’ve had to do a complete retooling of gastric juices. Some of these guys haven’t been used in so long I’ve had to retrain them. Liver: Noticed? My bile production is down over half since Miss Essie took over his menu! Now I’m the one who’s getting fatter. Pancreas: You think that’s bad? Because of Miss Essie, the enzyme union boss is furious and wants to know why I have laid off so many fat-dissolving enzymes in violation of our long-standing contract! He’s threatening a strike unless he sees a cheeseburger down here by tomorrow! Heart: Put a sock in it! You’ve all had it way too good for too long. And guess who’s been carrying you on his back all this time? Yeah, me and that’s over. Remember, if I decide to go on strike, that’s the ballgame for everyone. As for Miss Essie, she’s been through it herself. Now she’s my best advocate and I’ll hear no more about her. Funny how quiet little voices can sound so loud. And Miss Essie is a saint. 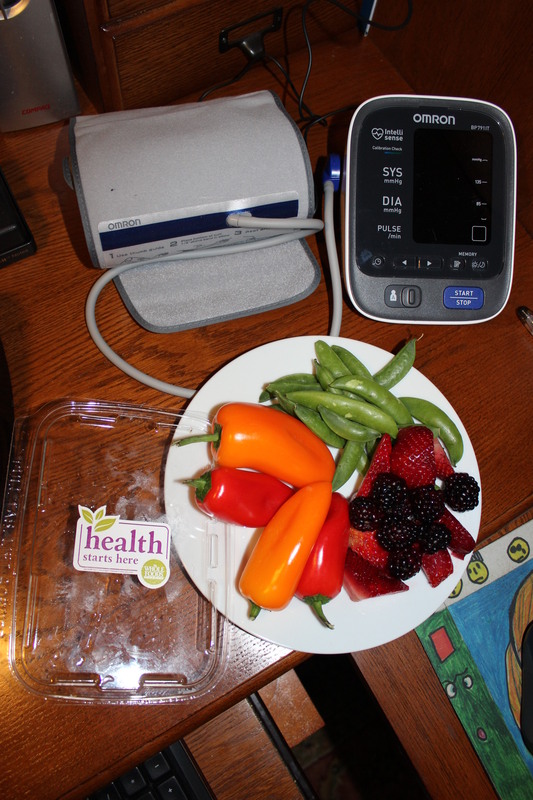 This entry was posted in Family and tagged Caldwell Esselstyn, fats, healthy eating, heart. Bookmark the permalink. 47 Responses to Trouble….thy name is fat! So sorry to hear about those pesky heart problems, Al. But I can cook a mean vegetarian meal. No fish either? Even salmon, the heart-healthy fish? Absolutely nothing! You know what a meany Patty is.For the last ten nights I have been dreaming of that brisket we had at your house. Well, I think it’s just rude that, if you do all that exercise stuff, you still have to eat healthily. It should be one or the other. Is there some correlation between your new diet and your new gravatar? I’ve got mixed feelings about heart attacks (having nursed one husband through one.) Personally, I think I’d rather check out with a sudden bang from a coronory than do battle with cancer or some of the other lingering ailments. . . do you have some chocolate you want pegoleg and I to use up for you??? The new gravatar is from a dare from one of my readers. She saw it on one of my blogs (my 8-year old granddaughter was drawing me and trying to be funny) Odd thing is, she really nailed the likeness. I agree wholeheartedly with your take. My dad went quite quickly with no suffering beforehand, but my mother lingered quite a while with heart failure. Leave it to you and Peg to gang up on me, but sorry to say my uneaten chocolate is now displayed in a glass case as a reminder of how fragile my eating habits have made me. However, you know what they say…..”everyone has their price”…. Alas, fish is off the table as well. But it still sounds like a good place to meet if you’d like to. We’ll be on our back to Charlottesville to pick up our pups, just in case that helps with picking a location. Assuming you leave via Route 29, Cassetts in Arlington with New Zealand fare is on the way. Much food there which caters to the health nut, i.e. Asian salad and such. Also good soups, at least one is veggie. That sounds good! Looking forward to seeing you April 20th. More on that later. You are lucky that Patty has your good health and interest in mind—-and good luck wrapping your heart around it all, Al. Thanks, Stacia. Oddly, I can distinctly remember my grandmother giving me the “you are what you eat” lecture when I lived with them for a while as a teenager. Of course back then, adults were clueless….they’re so much smarter today. You can do it, Al! (she says around a mouthful of Dove bars). Good for you for tackling this problem, and for listening to your wife. What great advice for all of us! Yes, and thankfully for me, she is Dr. Jekyll most of the time. P.S. Do those Dove bars still have that wonderfully chocolaty, vanillay, creamy, yummy-scrummy taste? Yes. Get thee behind me, Diet Satan! I can speak with some authority here because I am a hypocrite and weakling of the first order. While I shout the benefits of healthy eating and exercise from my arm-chair, I am often to be found reading books on “Bringing Science to Slumping” while eating cream teas. I am quite sure that, in time, some of the organs mentioned in my “life-support” committee are on the verge of muttering some rebuke. I am a bit careless about my own health. actually I can’t remember what it is, but I am, paradoxically, very concerned about the health of people I care about and , unfortunately for you, you are included on that list. Remember, the wife is always right even when she’s wrong, but in this case she right to be right. What am I talking about. Better shut up. Ducks, any comments from you are just the type of tonic I need. Keep ’em coming! When you make sweet comments like that, I have no choice but to keep at it. Thanks. I’m glad you’re listening! Go Patty! You Patty(i) types sure stick together don’t you? PS I haven’t actually hacked your computer!! Then why is my “You’ve got mail” announcement suddenly in a Gaelic dialect? Ermmm… Oops, I forgot to change that back didn’t I ? Good one Al! Seriously, take care of yourself. And be a good husband and let Patty take care of you. Thanks, Tammy. Miss ya, gal! The things we do for love…I mean Patty, Al, not you. That plate of veggies and fruit looked scrumptious! But you do need some fats in your diet–nuts. I mean walnuts, not going nuts. Or flax seeds. But Patty probably knows this and you’re just exaggerating in the name of blogetic licence (or junk food withdrawal-induced old fartery). Thanks Lorna, but nuts are also verboten. I guess she thinks I’m nuts enough already. I know you know how much I truly appreciate what she is doing for me. She shows her love to me in so many ways and this is just another. Thanks to her, I hope to be still bugging you for some time to come! I’m enlisting a cadre of friends to call Patty and keep her busy on the phone at various times. Interested? I’ll give you the best hours. What time zone are you in? You seem to come online about 1am here, which is a bit late for me! We are four hours difference from London. And you are kind. OK. I thought it was 5 hours. We went to what we call Daylight Savings Time a week ago last Sunday. That explains it. So glad you have someone to take care of you… What a blessing! It’s a dirty job and she’s the only one who will do it! Thanks. Just trying to put some perspective on the situation.